New Windows in your home or business from Capital Improvement can help reduce your heating and cooling costs, even with Louisiana’s unpredictable weather patterns. A PPG Warm-Edge Intercept Spacer System is just one way of increasing your window’s performance . Sunbelt Solar Control Glass is specially coated to transmit high levels of sunlight while blocking the heat generated by the sun. In winter, the same coating helps reduce the escape of heat. Thanks to this special coating, Sunbelt Windows with Solar Control Glass allow significantly less heat from the sun to enter your home than ordinary windows, helping to reduce summer cooling costs by up to 25 percent… even in Louisiana. Sunbelt Solar Control Glass Windows will increase energy efficiency in virtually every climate zone. In summer, it helps repel heat and glare, while filtering out ultraviolet rays which fade carpet, furniture, paintings and even painted or stained wood. In the winter, it lets in solar heat and helps hold the warm air inside. Argon gas is a colorless, odorless nonflammable, nontoxic, and above all a safe, inert gas that is heavier than air. 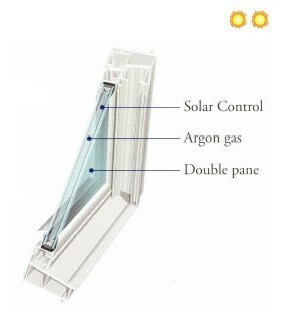 When the air between two window panes is replaced with argon gas, the energy efficiency of the window increases even more. Additionally, it also acts as a sound barrier, helping to make your home quiet as well as more energy-efficient. Sunbelt Paladin offers superior protection from the elements. Designed with three panes of glass, this triple pane 1″ insulated glass unit combines Solar Control and two chambers of argon gas, along with the PPG Warm-Edge Intercept Spacer System, to provide high levels of protection from southern heat. 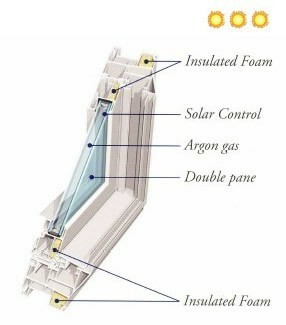 This glass package is ideal for windows that receive extreme levels of solar heat. Sunbelt Sentinel offers excellent protection from the elements. This double glazed 13/16″ insulated glass unit features one pane of Solar Control and one chamber of insulating argon gas, along with the PPG Warm-Edge Intercept Spacer System. 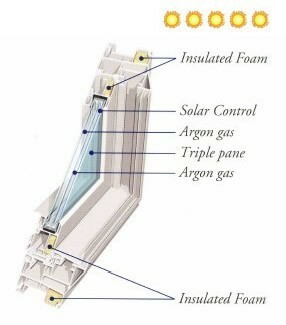 The Sunbelt Sentry window is a double-glazed unit built with a pane of Solar Control on surface (two), and there is a chamber with argon gas (better insulation), along with the Intercept Spacer System. Learn How our Replacement Window Save Energy.